Fri., Feb. 8, 2019, 8:58 a.m.
LONDON – The British and Irish leaders were looking to mend fences after a week of Brexit tensions at a dinner in Dublin Friday. 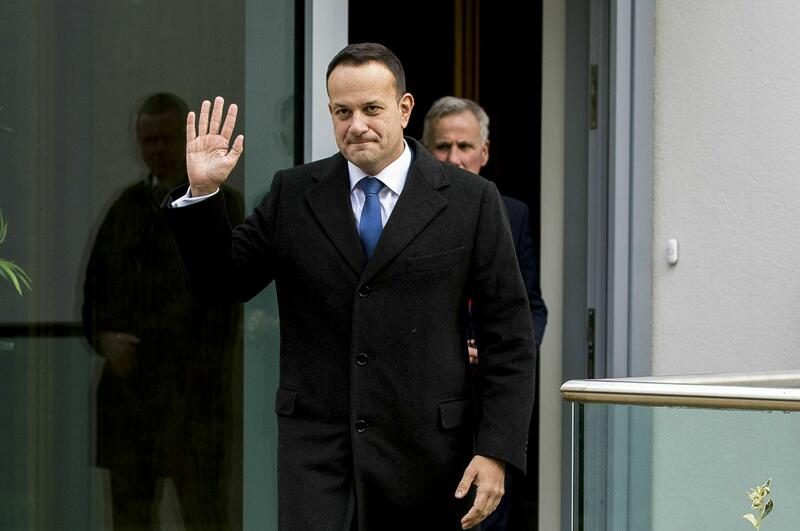 But Irish Prime Minister Leo Varadkar and his U.K. counterpart, Theresa May, sought to dampen expectations of a breakthrough on the thorny issue of the Irish border. “Today is a day for us to share our perspectives and for us to listen to each other,” said Varadkar, who also met Friday with Northern Ireland politicians in Belfast. “There is much more that unites us than divides us and time is running short,” he added. May’s office said she would be underscoring her desire for legally binding changes to the Brexit deal she sealed with the EU late last year. It was overwhelmingly rejected by Britain’s Parliament last month, largely over concerns about a provision designed to ensure an open border between the U.K.’s Northern Ireland and EU member Ireland. Britain is due to leave the bloc on March 29, and the U.K.’s bid for last-minute changes has exasperated EU leaders, who insist the legally binding withdrawal agreement can’t be changed. Neither side moved from their entrenched positions, but they did at least agree to keep talking, with May and EU Commission President Jean-Claude Juncker saying they would meet again before the end of the month, after more talks between their officials. The British and Irish attorneys general met Friday to see if there is any common ground on the border provision, known as the backstop. It’s a safeguard that would keep the U.K. in a customs union with the EU to remove the need for checks along the border until a permanent new U.K.-EU trading relationship is in place. Britain has suggested the backstop could be altered by adding a time limit or a get-out clause. Both ideas have been rejected by officials in Brussels. May is determined to get changes to her deal and win backing for it in Parliament, but many lawmakers want her to change course. Britain’s Parliament is set to hold a debate and votes Thursday on the next steps, giving lawmakers a chance to force May to tack toward a softer Brexit – if divided legislators can agree on a plan. The main opposition Labour Party said this week that it could support a Brexit deal if May committed to seeking a close relationship with the EU after Britain leaves. But any such move would cost May the support of a big chunk of her Conservative Party. The political impasse leaves Britain lurching toward a chaotic “no-deal” departure that could be costly for businesses and ordinary people in both the U.K. and the EU. “In the national interest, we have got to come together to secure a compromise,” he said. Two former heads of Britain’s civil service said the country was not ready to leave the EU on March 29 and should delay departure. Published: Feb. 8, 2019, 8:58 a.m.